The prolonged countdown to the UK’s withdrawal from the European Union has thrown the Conservative government into a profound crisis. Ciaran Mulholland explains that the chaos is such that an anonymous European source has compared the UK to a “failed state”, and that the EU was able to impose its own terms when May came cap in hand seeking an extension of the original withdrawal date of 29 March. At the time of writing Theresa May has tried three times to win a parliamentary majority for her draft withdrawal agreement, and has three times failed. The withdrawal agreement has been rejected on each occasion by a wide margin. The third defeat plunged the government into a mood of despair, and May even hinted at a general election if no way forward can be found. 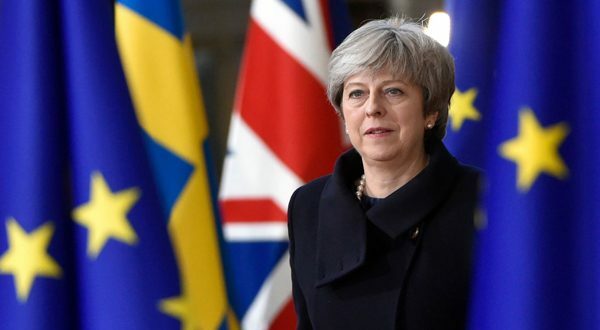 As things stand the UK will leave the EU without a deal on 12 April unless the draft withdrawal agreement is accepted by Parliament in the coming days, a long extension of months or even years is granted, or Article 50 is revoked and Brexit is “cancelled”. If the withdrawal agreement is passed 22 May will be the new withdrawal date. The indications are that May is hoping that one final vote, coming at the eleventh hour, will put immense pressure on MPs and sufficient numbers will switch sides rather than risk a “no-deal” exit. Some Tory MPs have indicated that they will indeed switch in such a scenario, and behind the scenes talks with the DUP are continuing in an attempt to win its 10 MPs over, but it is still most likely that May will lose again. In normal circumstances, a government defeat on its key policy would bring it crashing down, or the Prime Minister would resign, but these are not normal times. What happens after another failed vote (or if there is no vote) is a matter of intense speculation. May has set her face against revoking Brexit. A long extension would mean that European elections would be necessary in the UK and this is regarded as a toxic option by the Tories. A second referendum is also anathema, not just for most Tory MPs but also for many Labour MPs from leave-voting areas. The Conservative Party is in a state of chaos. May has signalled her intention to step down if her deal is agreed and her opponents within the Conservative Party are jockeying for position in the hope of succeeding her. A desperate May might consider appealing to the public above the heads of MPs by calling a general election, but Tory MPs are very unlikely to agree this as they fear that this would result in the election of a Labour government led by Jeremy Corbyn. Predicting exactly what will happen next is incredibly difficult. There is a real danger of a no-deal Brexit, with all the chaos this would produce, unfolding in mid-April, but it is more likely that a long delay will be agreed at an EU summit on 10 April. May cannot obtain a parliamentary majority for a number of interlocked reasons but the crunch issue is the “backstop”. This is the proposed arrangement, which is claimed to be necessary to avoid the return of a hard border on the island of Ireland, an eventuality that would “put the peace process at risk”. The EU is insisting that if the UK leaves the customs union and single market then there must be new border checks somewhere in order to protect its trade interests. If the Irish border is to remain open, then there must be new checks on goods crossing the Irish Sea instead. In other words the EU is presenting a rigid binary choice: either a hardened North-South border or an East-West border. Simultaneously, any hardening of the North-South border, no matter how minor, is seen as a threat to the national aspirations of Catholics, and any imposition of new border checks will be met with fierce resistance, including the physical tearing down of any infrastructure. In any circumstance the different positions of the Protestant and Catholic communities would have been problematic, but the accidental fact that the DUP hold the balance of power at Westminster has precipitated a full-blown crisis and has in effect blocked the UK’s planned departure. This is the context in which the Socialist Party has considered the draft withdrawal agreement. The key to determining the position of socialists is always to consider what is in the interests of the working class. The Socialist Party is opposed to the EU, an institution created in the interests of the various capitalist classes of Europe. We oppose the Tory government that unashamedly represents the interests of British capitalism. Any deal that is negotiated between these two players is bound to undermine the rights and conditions of the working class. The referendum vote for European withdrawal in 2016 was a manifestation of a profound sense of alienation from the neoliberal “political centre”, and the majority of those who voted for Brexit did so to express their anger at the years of austerity and de-industrialisation. It is essential that the workers’ movement also considers the potential impact of the withdrawal agreement on sectarian divisions in the North. The draft agreement outlines a scenario in which there will be a developing East-West border. This will increase sectarian tension and weaken workers’ unity, and we are opposed to the agreement on this basis. The trade union movement should reverse its current position and come out against the draft agreement. We have been warned that if the agreement is not voted through the UK will crash out of the EU, and a hardening of the North-South border will then be “inevitable”. If this were to happen it will increase sectarian tension and weaken workers’ unity. We are resolutely opposed to this scenario too. We do not accept that border checks or controls on the North-South border are in fact inevitable. The trade union movement must oppose, and refuse to implement when possible, such measures. Opposition must be clearly expressed on the basis of the interests of all working class people, Protestant and Catholic, North and South. This is not possible if the trade union movement backs the withdrawal agreement, which explicitly points in the direction of a hardened East-West border. The trade union movement unites working-class Catholics and Protestants in a shared struggle for a better life. This unity has to be fought for, and is put at risk by support for the withdrawal agreement. The only way in which the rights of both communities can be respected is to keep both borders open. The logic of capitalism dictates that this is not possible but we reject this logic. Ultimately, increased border checks can be avoided by the EU and the UK governments taking the political decisions necessary to keep the North-South border open and to not allow an East-West border to develop, whatever the supposed impact on trade. As such an approach will hit big business profits we have no faith that they will do so, unless under immense pressure from below. 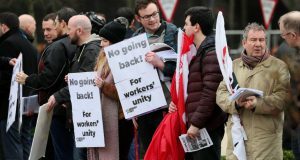 In order to protect the wider interests of the working class it is vitally important that the workers’ movement intervenes at this time with an independent, socialist programme on Brexit. The workers’ movement should draw its own “red lines” on the key issues. Trade unionists in Ireland, North and South, are united in the Irish Congress of Trade Unions (ICTU) and have strong links with their fellow trade unionists across England, Scotland and Wales. If the trade unions were to bring their combined weight behind a movement for a new Europe, organised in the interests of the 99%, then millions could be mobilised across these islands and across Europe in opposition to any form of Brexit which favours the capitalist class. The trade unions must mobilise to defend the wider interests of working-class people and preparations should be made for industrial action to defend workers’ jobs, wages, conditions, and rights. Preparations must also be made in the North to counter any increase in sectarian tension and conflict, including preparations for protests, demonstrations, and if necessary, industrial action. An emergency conference, with the widest participation of workers’ representatives from workplaces across Ireland, North and South, must be convened, in order to allow a full democratic discussion on how to best oppose both the EU and the attacks of the Fine Gael and Tory governments. Trade unionists in England, Scotland and Wales should be asked to send representatives to this conference and links should be forged with trade unionists across Europe who are also facing attacks originating from the EU. 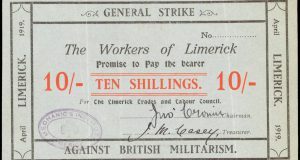 From this conference a clear action programme of strikes, protests and occupations could be brought forward in the event of cutbacks, job losses and attempts to undermine workers’ rights. Socialists in Ireland would welcome the return of a Corbyn-led government in Britain. If such a government were to adopt a position of socialist opposition to the EU this would transform the situation. It should seek to re-open negotiations and demand an entirely different relationship with the EU, including new trade and customs arrangements, based on the interests of working-class people, not those of the bosses and the bankers in the city of London. It would make an appeal to the working class across Europe, over the heads of their capitalist rulers, to join workers in Britain in a struggle against a common enemy; the EU and the capitalist system it represents. Socialists are in favour of a genuinely united Europe. This will only be possible when the socialist transformation of society allows the voluntary coming together of all the people of Europe in a democratic, Europe-wide confederation. We fight for a socialist Ireland, with full democratic rights for all communities. We favour a voluntary socialist federation of Ireland, Scotland, England and Wales, as part of a socialist Europe, and will raise these demands throughout the workers’ movement in the months ahead.